If you’re avoiding or reducing grains, this dish will be a good source of complex carbs for you. 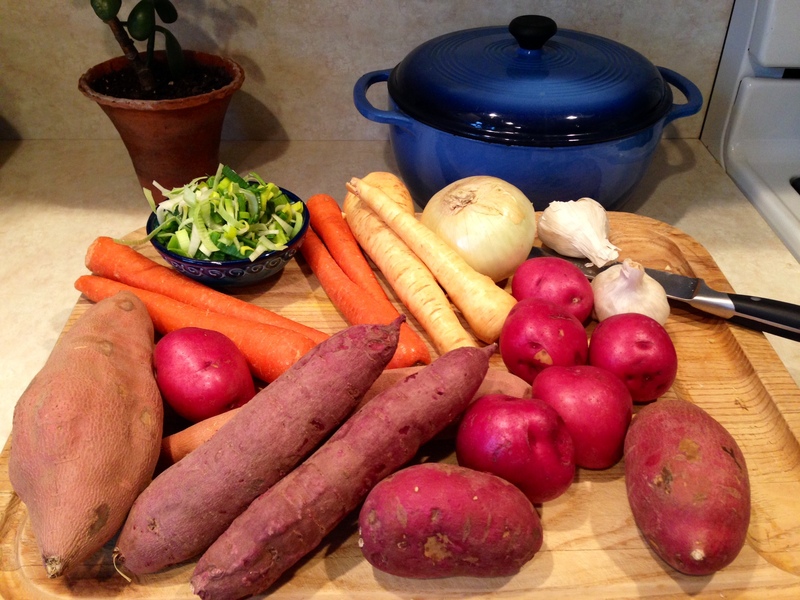 Root vegetables will help reduce carb and sugar cravings. 2. Cut first five ingredients into ½ inch pieces and place in roasting pan. Cut the carrots a bit smaller than the rest of the vegetables so they cook at the same rate. 3. Add onion and garlic to roasting pan. 4. Drizzle olive oil over all & mix well. Vegetables should be generously coated with oil. 6. Bake 30 minutes, then stir the veggies and finish cooking (about another 30 minutes, or until very tender when pierced with a fork. This will depend on how big the veggie pieces are). Taste them at this point and add salt if necessary. 7. Remove from oven and loosen the vegetables that have become stuck to the pan.